Hawaii Army National Guard’s Sgt. 1st Class Clayton C. Perreira, was recognized as a Hawaii Chamber of Commerce – Military Affairs Council Outstanding Community Service Honoree at the State Capitol, May 5, 2017. Presenting the certificate was Gov. David Y. Ige, Maj. Gen. Arthur “Joe” Logan and Brig. Gen. Kenneth Hara. Perreira is the Hawaii National Guard’s top Community Service Honoree. 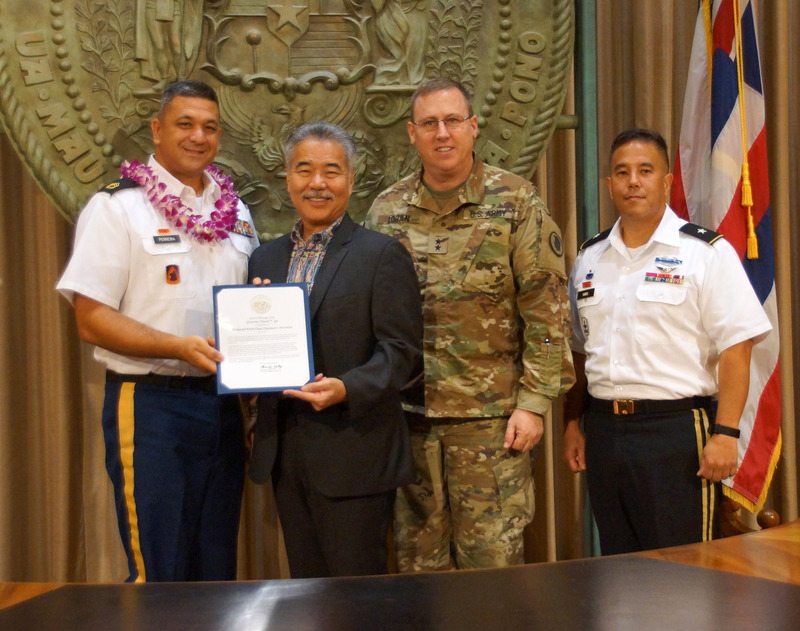 The Hawaii National Guard commander in chief, his adjutant general and deputy led the congratulations to Perreira, from C Company, 1st Battalion, 207th Aviation Regiment, and all the other military services honorees. Perreira, a UH-60 Blackhawk helicopter crew chief, was recognized for his volunteerism as the Hilo High School Marching band coach for the last four years. He was a former band member of the Hilo school, the UH Ensemble and Hawaii County bands, primarily playing brass instruments like the tuba and saxophone. His volunteerism stems from his wanting to give back to the community. At the school, his contributions include teaching marching, some music instruction and instrument repairing.